As a must to get your show ON and succeed, your business needs to make the trade show booth a welcoming and inviting place for the attendees. Trade show displays like retractable or step and repeat banners offer the most powerful and impactful visual presence for your company. Eye-catching trade show backdrop stands with well-designed displays will leave an indelible impression and increase the chances of people stopping at your booth. Front Signs – being an LA-based sign-making and printing company is serving thousands of clients all across California. And more than 300 of those loyal customers of ours take part in all kinds of trade shows, fairs, etc across over 70 industries – all year long! All this experience allows us to confidently make this statement: we fully understand what you expect from trade show/corporate event visuals and are 100% capable of providing the solution in alignment with your brand. Having said all that, we will make sure you deliver your brand voice & message in the most resonating manner – and- help you connect with your customers becoming a massive success in the next trade show exhibition. Your banner stand is your business card that creates the first impression and makes the prospects strive for more quite inevitably. Custom trade show displays are an excellent and cost-effective marketing tool. It helps to upgrade your business advertising, present your company, services and products in the most impressive, unforgettable, yet – trustworthy- way. We realize, your brand signage must be on the highest level to amp your business success, help you stand out during trade shows & fairs, expos, business presentations, conferences, gala openings. Thus, we are offering several types of custom trade show booth banners and POP displays which may help you to achieve that – BIG TIME. 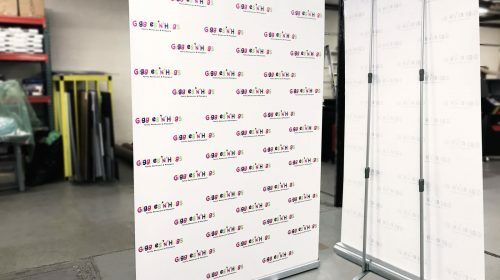 The triplet banners – namely retractable, X-stand and Step and repeat backdrops are the classic must-haves during any trade show, expo or conference. Below, you can find brief descriptions for each of trade show banners, displays & stands. If you need bespoken trade show display and signage solutions, pop up displays are what you might be looking for. These POP displays emphasize the graphics providing a vivid visual appeal to guarantee solid number of foot traffic towards your trade show booth. These portable eye-catching pop up displays are also utilized at corporate events, gala openings, conferences for business promotion. Being one of the most massive promotional pieces of trade show booth it draws all the attention towards your message and graphical artwork. Here at Front Signs, we provide business owners a beautifully designed and easy-to-assemble pop up banner stands. And because the whole production process takes place across different departments at our main headquarters in Van Nuys, LA… we (and you) have full control over each step of the production process and quality of the products. 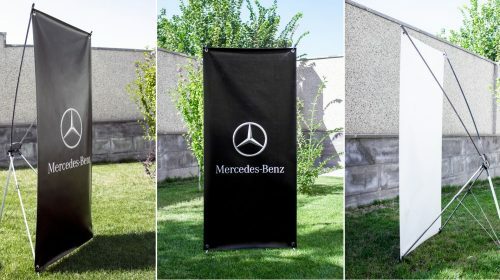 The pop up aluminum frame can be installed within minutes, and the cloth graphics can be attached to the frame using velcro fasteners. No additional tool or an extra pair of hands are needed for assembly. These trade show displays can have custom features to make your graphics look magnificent at the exhibition venue. It’s highly flexible for various events, easy to carry around in a case and affordable for long-term business usage. 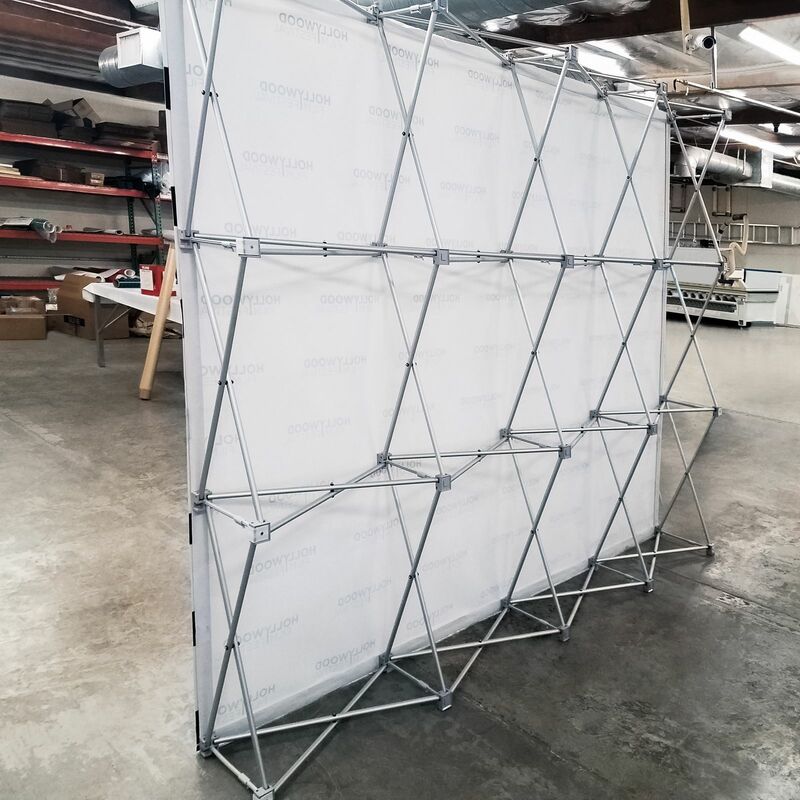 Pop-up media walls come in two sizes: 8x10’ and 10x10’ to be used as an accent wall or a part of a larger promotional trade show campaign - for example - an island booth. Come in various configurations and two sizes in a compact, sturdy case making it a mobile and convenient travel companion when it comes to promoting your business in different event locations! Setting up a pop up display is as easy as ABC. Firstly, take out the accordion-like construction out of its carry case. Put it on the floor and extend the frame to the upward position by fixing all of its supporting magnetic parts. After making sure the frame is secure in its place move on to the graphics. Attach the fabric banner to the frame using velcros. Start from one corner and continue until all the sides of the graphics are securely attached to the backdrop frame. 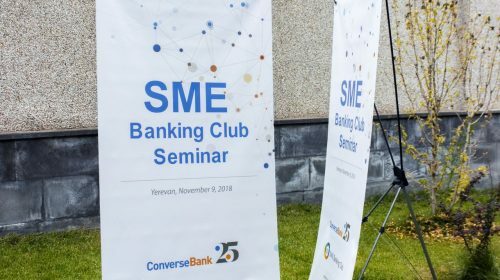 Need an easily-portable and quick-to-set-up retractable banner for the upcoming event to boost your brand and attract new clients? You are in reliable hands. Retractable banners - also known as roll up banners - are an ideal solution for malls, showrooms, trade shows and other LA-wide promotional areas to grab the attention and reel in potential clients towards your establishment. We are using superior UV, weather-resistant, durable inks for printing of retractable stand up banner to be sure that it lasts long and preserves its vivid picture and color for years to come. Front Signs offers high standard, compact and lightweight retractable signs suited for all kinds of business events- retail promotions, sales, conventions and training seminars. We share years of industrial experience working with companies of all sizes - starting from local mom-and-pop operations and ending with international corporations offering them effective retractable banners with exceptional artwork to stand out in the crowd. Retractable banners have three main construction parts with high emphasis on the base. 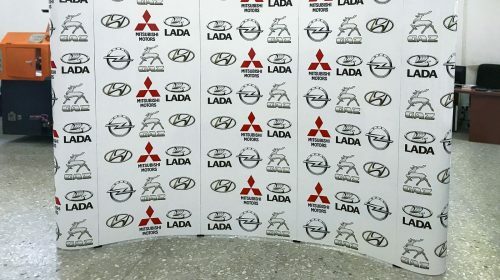 The base has a spring-loaded roller mechanism, which is the main reason that these standees are also known as roll up displays. The roller mechanism is the reason that makes retractable signs so popular. It holds the banner under great tension when set up and quickly pops the banner back into the base when removed. The base also serves as a protective storage unit for the high-grade vinyl material and the pole, which connects these two parts together. The banner has a matte finish and can be used for a long time, easily replaced with another, if needed. Retractable stand signs can be easily opened and displayed. You can assemble the pull up banner in no time. Take the stand out of the carry case, put it on the ground and swing out the stabilizing feet. The mechanism is simple: pull out the banner from the base of the stand and connect the pole to the slot of the banner. 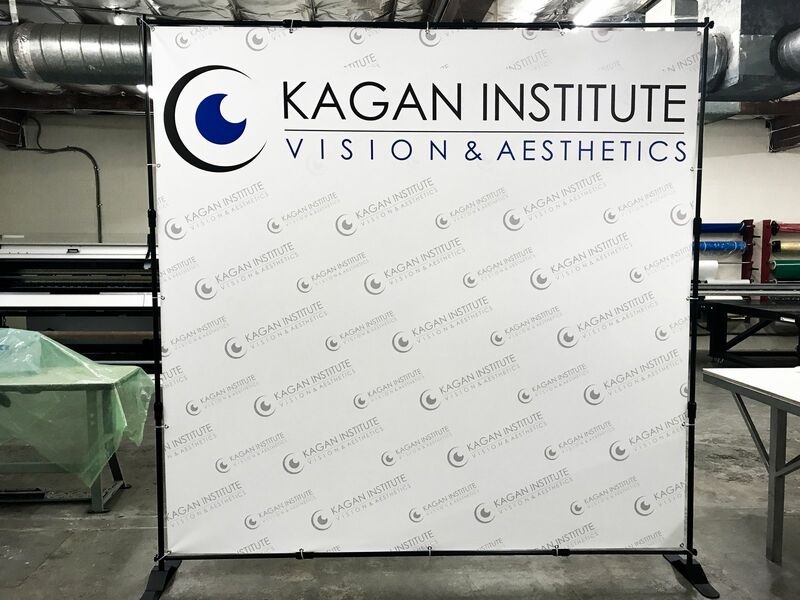 Telescopic banners - also known as step and repeat banners - provide the visuals and professional appearance at trade shows, business presentations and other promotional occasions. It’s a multifunctional display to grab people’s attention and transfer your company’s message in an effective way. With an outstanding and attractive step and repeat, you will wow any prospect. 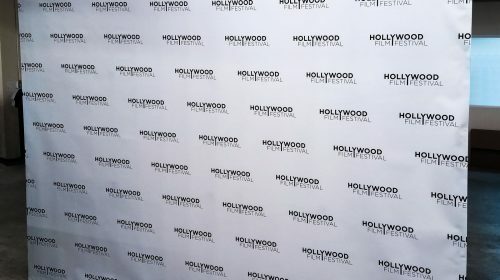 As a matter of fact, custom step and repeat banner in Los Angeles is an increasing trend in the local display market. It’s a popular choice to draw people in, reach the target audience and help them gain some information about your brand. Telescopic banners - popular choice to make a visual marketing impact - are an advertising medium with adjustable units to promote your business and leave an unforgettable impression on the potential clients. 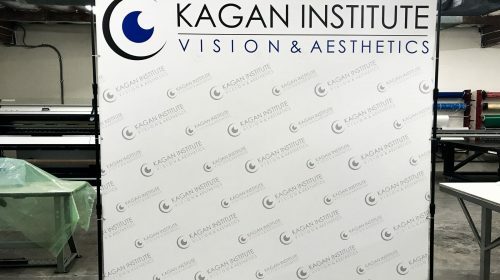 These step and repeat banners are highly used in colleges and other educational institutions, presentations and conferences, hotels, foyer displays, stores for presenting commercial and non-commercial campaigns. 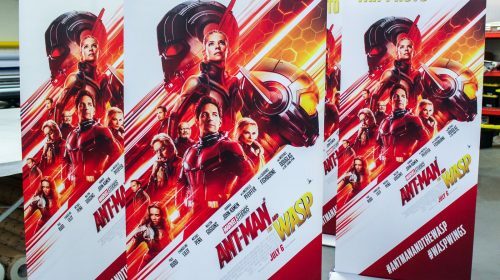 Step and repeat banners provide a wider exposure due to the large size of the graphics. Front Signs offers telescopic banner stands with customizable length and height. You can also purchase the banner or the stand separately. Simply put telescopic banner is square or rectangular metal construction with a custom-printed vinyl banner. It’s a banner hanging display with stabilizing feet attached to the base of the backdrop frame. The display is fixed on the frame via grommets or pole pockets. To set up no special tools are needed and the whole process is just a matter of a few minutes. For backdrop installation with grommets and hemmed edges, the first thing to do is - to assemble the frame using the telescopic poles. Use the zip ties to connect grommets to the frame from all four sides! 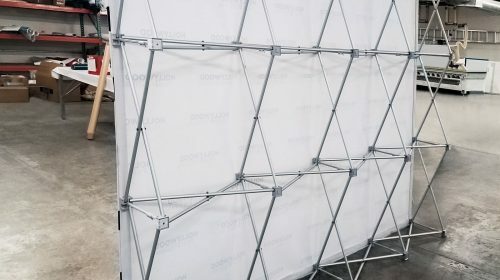 Backdrop with pole pockets requires alternative installation: first, pass the display through the top horizontal top and bottom poles and then fix it onto the vertical poles. If you need a portable yet very effective advertisement, X stand Banners are exactly what you are looking out for. 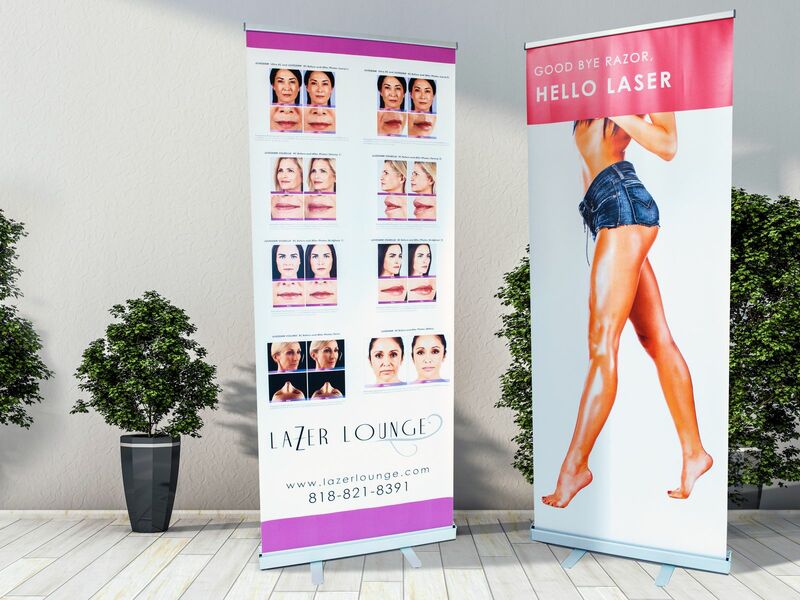 Promote your campaign and attract customers with the help of these lightweight banners. X stand Banners are often used at trade shows, presentations and other events happening in Los Angeles. You can display all types of information on these banners with your custom graphics. Be it the name of your company, the services you offer, your company contact details or any other important business-related info be sure that your stand will attract everyone’s attention. These banners are perfect if you require a temporary advertisement, as these stands are affordable yet highly effective signage solutions. These banners are also ideal for transportation, as you can uninstall and reinstall it in another venue within minutes. X banner stands are also an advertising tool for malls, business centers and banks to promote seasonal discounts and special offers. 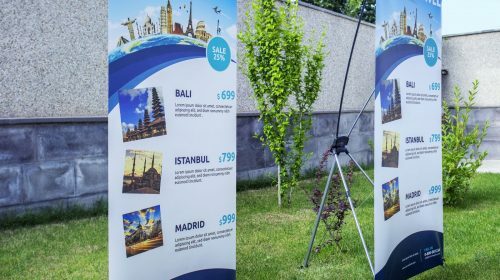 Furthermore, travel agencies, event planners or retail outlets use these X-banner stands as an instrument to announce upcoming events and contact information. It’s made up of two main parts: X- frame with hooks and a banner. In contrast to Retractable banners, these expo displays have separate stand and panel. The four arms or grommets on each corner of the X-Frame holds the panel taught under big tension to make the construction even more secure and stable. As already mentioned, the banner is not connected to the frame so changing the display is very simple and cost-effective. 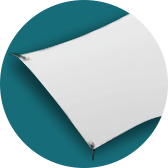 Front Signs provides ready to use banners with eyelets to the existing frame if required. The frame and the printed banner altogether weigh approximately 3 lbs. The frame is made of high-grade aluminum. The material makes the construction secure but also portable and lightweight at the same time. The installation takes less than 60 seconds (actually checked with a stopwatch!). No tools are needed to set them up or take down. To set up the banner you need to open up the tripod base and insert the supporting arms with hooks facing you. Afterward, attach all the grommeted corners of the graphics onto the hooks and you are done with the installation. Accessories and custom POP displays give additional benefits to your company’s booth at any expo in LA, California. The tasteful and professional combination and usage of these equipments can further enhance your brand presence. Hanging displays are versatile and stand out among the bunch of freestanding displays. It provides high visibility from a far distance and is a smart approach to increase the exposure above the crowd. These trade show displays can have a circle, square or any other shape that best fits the image of your brand. For open expos, tents and canopies with your brand name and logo are also handy. These tents can be later used for concert venues to provide extra shade where attendees can escape the sun and learn about your company at the same time. Tablecloths are another type of highly-effective tools used at trade shows. Sometimes you can emphasize the interior of your booth in this cost-effective way. Tablecloth with the name or the logo of your company printed on it is a better solution than having an empty table. Point of sale displays are perfect for transferring the message of your company and making the information more accessible to curious attendees. In addition to that, counters and kiosks are an effective way of product demonstration. Island booth display or hybrid display is the “queen” of the trade show displays. It draws all the attention of the visitors toward your brand. Being a creative mix of all the above-mentioned products it’s a smart solution for making your company's voice heard at trade shows and expos. High-quality displays like banner stands are used as a marketing medium for retail, educational, hospital and even financial segments – just to name a few. Due to its customized size and height, they are suitable for fairs, expositions and conferences and more. Banner stands provide a fantastic return on your investments. 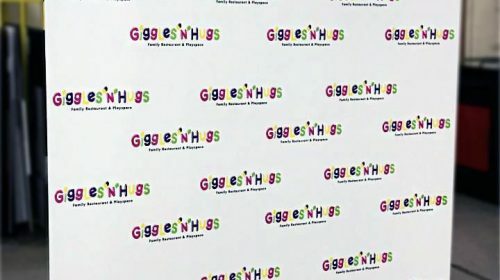 Here at Front Signs, we provide customized banner stands for various occasions like Birthday party backdrops, event step and repeat, brand backdrop stands, grand and gala openings & commercial backdrops, nature and scenery banners and etc. Furthermore, it’s great for colleges, universities or any other educational institutions, hospitals, small businesses and NGOs that need to make a big marketing impact but are on a restricted budget. It’s also an advertising tool for malls, lobbies and banks. Travel agencies, event planners or retail outlets use these stands as a tool to display their seasonal offers, special events and contact information. Additionally, you can use the banner stands to provide any information for your customers and passers-by at corporate, sport and cultural events. You can choose these stands to reach mass media platforms like Facebook, Instagram, Twitter etc. It’s a prime advertising tool when the pictures with the background of your banner appear online; where they stay for a long time promoting your brand and company. These portable trade show displays help to brand your booth, exhibition or special marketing event. It’s perfect for corporate logo and brand messages – it’s like a wall decal but flexible, with a bigger impact and dimensions! Lighting your exhibition banner stand and Point of purchase display is very important. The right intensity of the strategically placed illumination will only increase the curious looks towards your stand. LED lighting gives a more professional look to your display and enhances the brand appeal. It’s a tool sometimes overlooked, which means that you can use it to gain a massive leg up over your competitors. You can highlight the key parts - give more emphasis to your logo and product. Additionally, you can use spotlights to create key areas and focal points to draw more attention. Last but not least, you can also use LED Backlit signs to give an irresistible glow to your signage. Front Signs offers direct printing services from wide and medium to large-scale formats to accommodate your needs. You can get top-notch Step and repeat & retractable printing with the advanced digital printer technology. We We deliver fast and supreme quality- sun and fade resistant banners meant to last long even after constant usage under direct sunshine. Our team of designers and craftsmen are ready to help you with the print solutions that bring to even bold ideas to life. 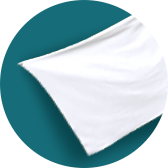 To clean the banner no special fluids are needed - only water and liquid soap. Use a soft and slightly damp cloth to clean the surface. Note: Don’t use scrubber sponges on the banner and make sure it is completely dry before you store it. You also need to keep away solvents like alcohol, acetone, gasoline from the banner as these liquids can cause irreparable damage. To store the banner, carefully roll it with the printed side facing in and keep it in a dry place until the next use. Due to its unusual shape - The X-banner stands out from the roll up and telescopic banners. It has X construction and tripod base, which is just ideal for displaying the banner in the corners. Island display or hybrid display is the “Queen” of trade shows. Situated in the center of the venue, it helps to draw all the attention and collect the most foot traffic. Being a creative mix of trade show backdrops and products such as roll up banner, telescopic backdrop and pop up displays - and trade show supplies like decorative kiosks, shelving, it’s a highly-effective promotional tool. Island Display is totally custom-made signage booth with one-and-only design and concept. It adds selling power with its visual presentation. Creates more expensive exhibit design and conveys your leadership position in the industry. Here are the main advantages of each type of banner stand (real quick): Pop up stand sign is very popular because it is a large format portable display yet very easy to transfer. You can carry it with you and easily set it up within minutes - no assistance required. Custom Retractable banners don’t take much space that’s why you can take them with you from place to place in a carry bag. Telescopic banners leave a professional appeal with a simple metallic construction. The metallic poles attached to the steel base with screws make the banner steadily fixed in its place. X banner has a higher accent on the graphics and is ideal for official events - such as expos, trade show, etc. The construction has a tripod base, which is ideal for securely placing it on flat surfaces. Here are the types of expo stands and displays we offer here at Front Signs: Banner stands: telescopic backdrop, pop-up banners, X-frame banner and roll up banners. Stands and displays: cutouts, backdrop holder stands, decorative displays, etc. For raising the effectiveness of your trade show or event, for making the exhibition booth more eye-pleasing, you can use any of these displays ideal for both outdoor and indoor usage. If you’re getting ready for a trade show, this complete checklist for trade show preparations, D-Day and post-event activities will be a timely help, check it out.